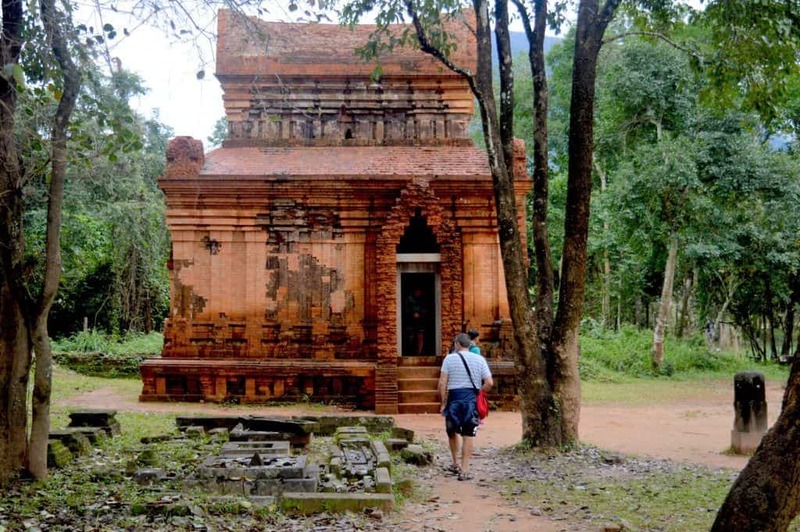 When your looking for things to do in Danang, two of the main attractions are My Son and Marble Mountains. 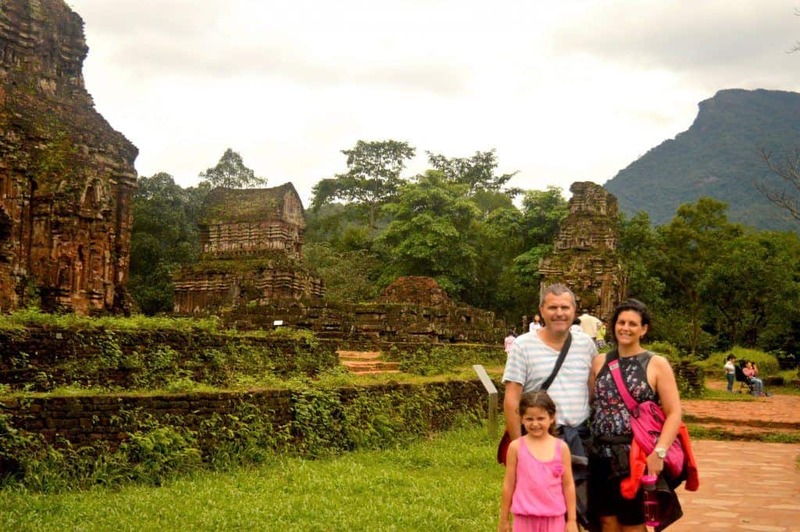 So we combined a private day tour to both My Son and Marble Mountains with a drop off at the Danang Airport. 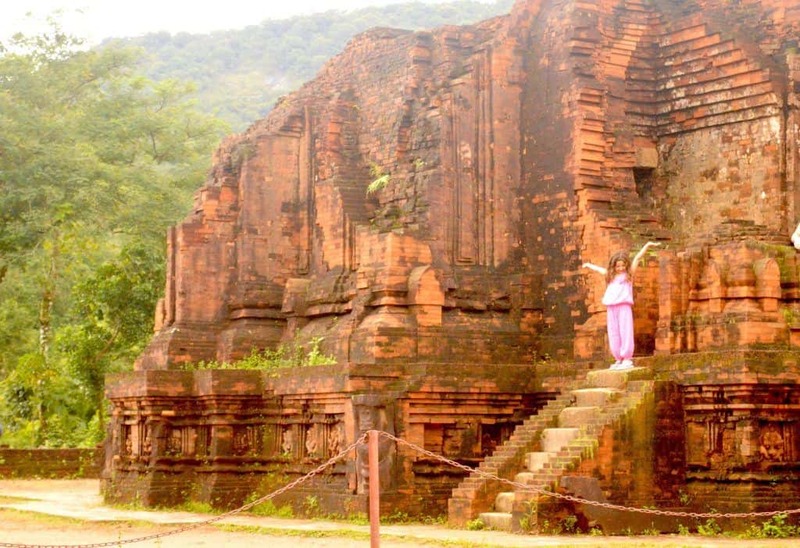 You can however easily arrange a day tour to My Son and / or Marble Mountain from Hoi An. 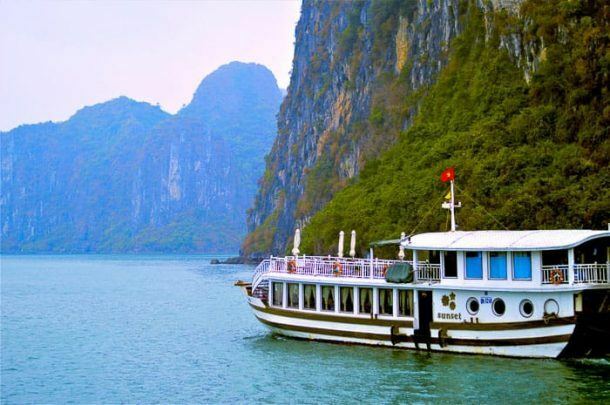 We arranged our private tour with Hanoi Transfer Services. Our guide Lin and driver picked us up from our hotel at 11 am and we were dropped off at the airport at 4.15pm. 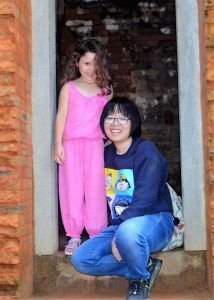 Lin was a fantastic guide and a hit with Myla who quickly announced that Lin was her new best friend. Lin’s English was fantastic so she was able to share her knowledge about the various sites with us throughout the day. The entry price to My Son is 150,000 VD (approximately $9 AUD) for adults and kids are free. The car park and entrance to My Son are quite far from the actual My Son structures. 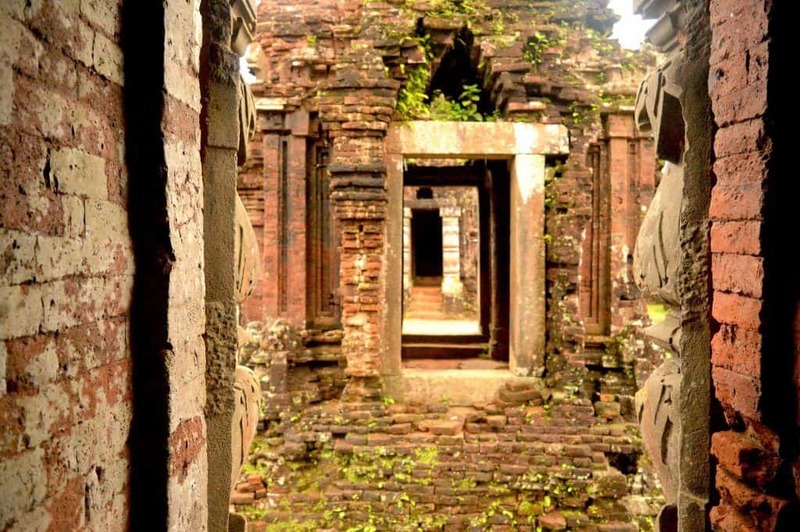 To get to the ruins, you can ride in a shuttle bus– they come regularly picking people up and dropping them off. I don’t think we waited more than one minute. Alternatively, you can walk the couple of kilometres – however it is hot and a little steep. Take the shuttle bus! The ride to the actual My Son structure is quite pretty through a lush jungle valley, alongside little creeks. 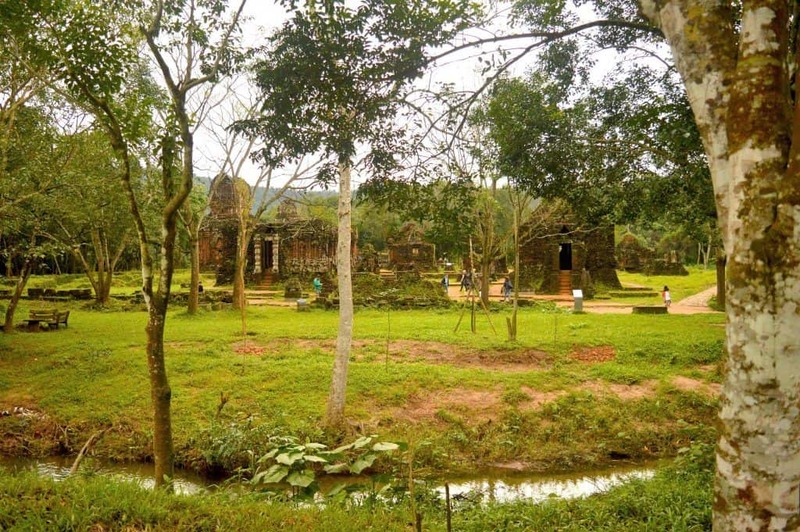 The My Son structures themselves are also set among the lush jungle valley – it’s absolutely stunning scenery here. Apparently there were originally 68 individual structures, whereas now there are only 20 standing. Whilst some structures are almost toppling over, others are in almost perfect original condition. The level of detail in some of these building is mind blowing! 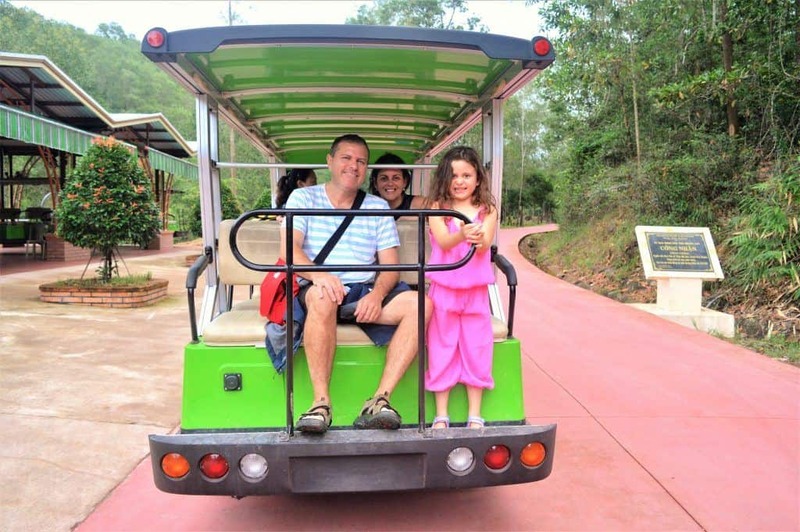 Myla absolutely adored exploring the various structures – it really is a great place to take the kids. My Son was also a battle ground during the Vietnam War, so there are numerous massive holes in the ground from bombings. It is quite devastating actually to think that countries like Australia are responsible for some of these magnificent structures being destroyed. If you are interested in visiting My Son I would allow around 90 minutes. We went during winter and it was quite hot – so remember to bring plenty of water, hat and sunscreen. 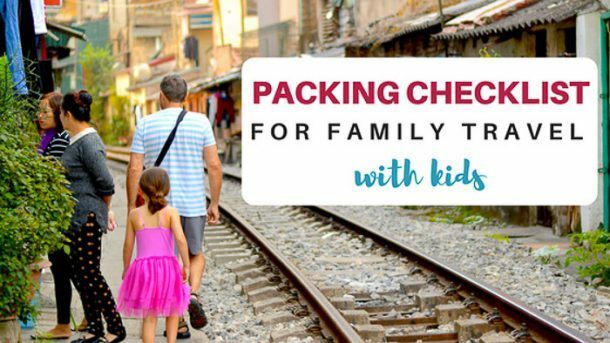 In the hotter months you would probably be best to get there as early as possible before the midday sun. After our visit to My Son we went to visit the Marble Mountains. 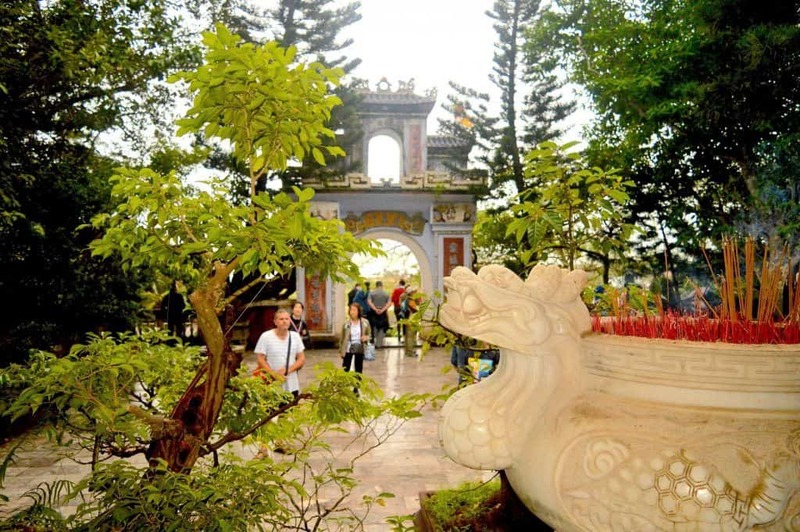 The Marble Mountains are located in Danang. 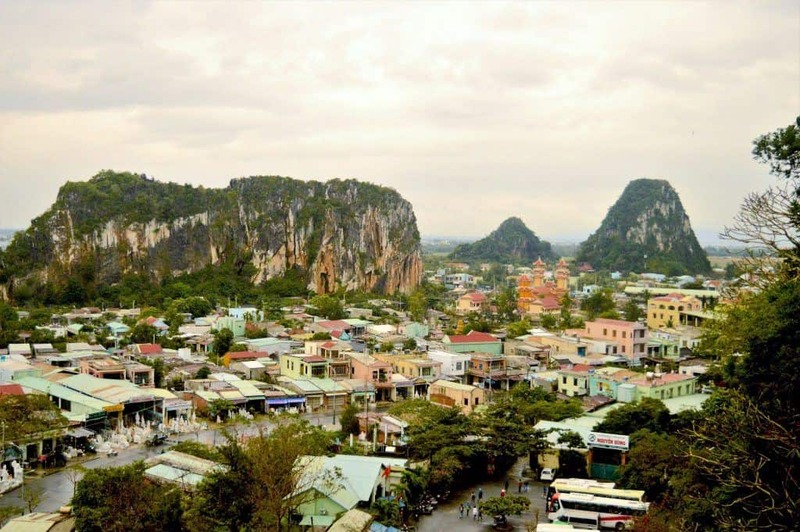 There are actually five different mountains that make up Marble Mountains with the main one being Thuy Son, the steepest of the mountains. 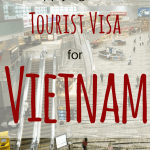 You can walk up the extremely steep stairwell to reach the top of Thuy Son or do as we did and take the elevator for 40,000 VD (approximately $2.40 AUD) per adult with kids being free. At the top of the mountain, there is a lovely look out across Danang and out to the other mountains which make up Marble Mountains. 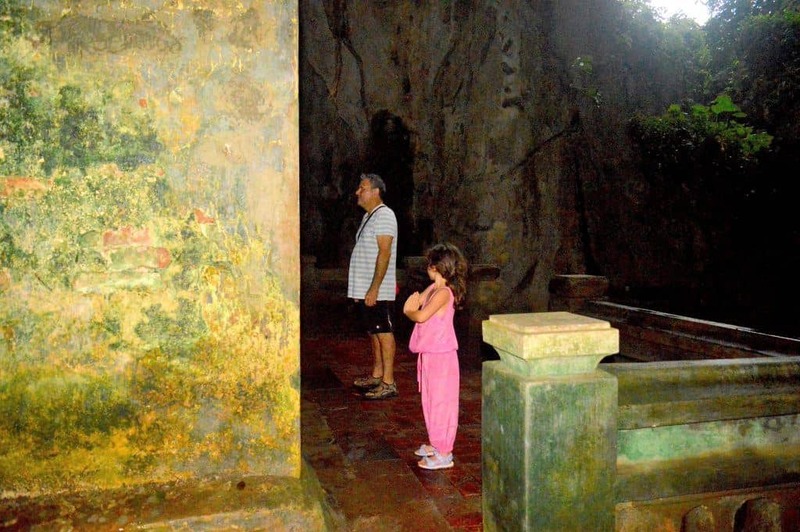 There are also several caves which contain hidden temples and altars which is quite interesting. 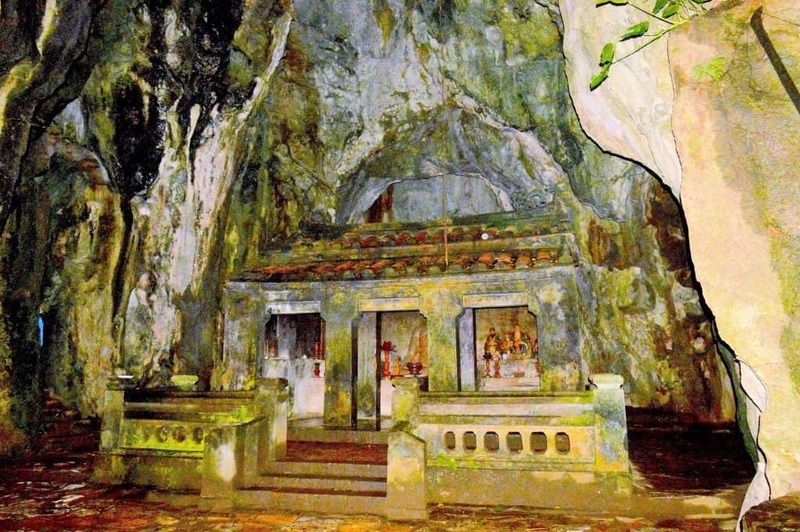 Whilst it was a nice place to visit, I don’t think the Marble Mountains is a must see. If you decide to go, allow around 20 minutes. After we visited the Marble Mountains we were dropped off at Danang Airport so we could catch our flight to Ho Chi Minh City. Whilst our tour guide Lin was fantastic I must say, overall, I was not impressed with the service we received from Hanoi Transfer Service. 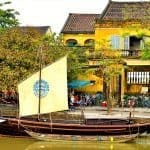 We used Hanoi transfer Service throughout Vietnam to be picked up and dropped off at the airport as well as this private day tour. Whilst in the end we were always picked up and always dropped off – it was not without incident. On one occasion our driver was not there to meet us at the airport and after some emails back and forth to the office, we finally had our driver meet us. Whilst I understand stuff happens – after this particular hiccup, we were told it was our fault and we must have given them the wrong information or we changed our flight etc. – none of which was true. On another occasion, our driver was almost 30 minutes late to take us to the airport. We called the office and were initially told they had no record of our booking, when I emailed them our booking, our driver eventually turned up. Luckily we made our flight on time. In relation to our day tour, the day prior a lady from their office called us to confirm the tour – which was great. However, the lady just talked about our trip to My Son – when I mentioned Marble Mountain she advised if we wanted to go there I would have to pay an additional $20 US. I was quite upset by this given we had already paid in advance for the trip and refused to pay it. 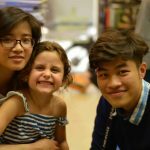 Eventually after I emailed our booking showing we had requested a tour to My Son & Marble Mountain, they agreed to take us there without paying anything additional – however this was the last straw and I would not recommend Hanoi Transfer Services to anyone. In case Lin finds this post and is reading it – Lin is fantastic and we highly recommend her!! 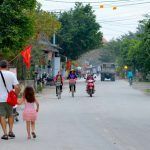 If you are looking for more things to do in Danang you might wish to consider staying in Danang. We certainly did consider it, but we just did not have enough time. 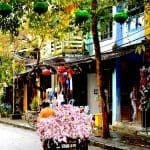 There are plenty of great hotel options in Danang though for fantastic prices. Prices start at around $20 AUD for a great basic family room in a hotel. 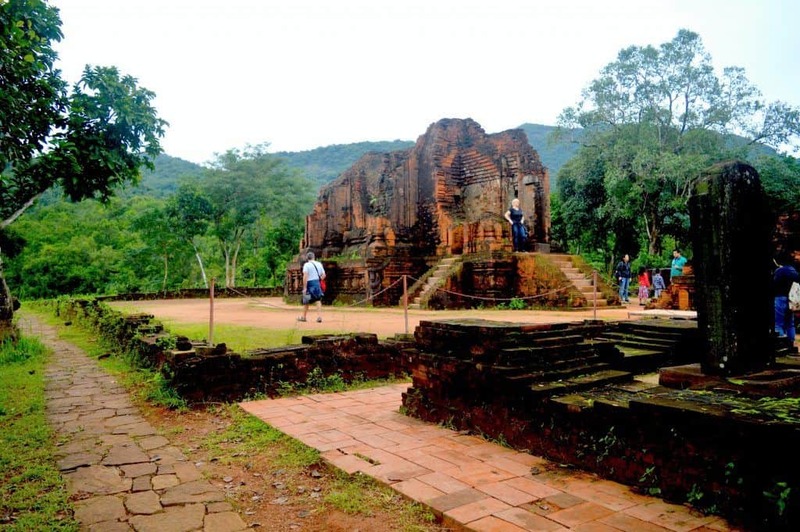 Click here for a list of hotels in Danang. 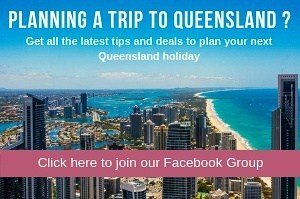 Disclaimer: This post contains affiliate links which means if you book using one of my links contained within this post – I will receive a small commission at no extra cost to you. Want to keep this post handy for later? 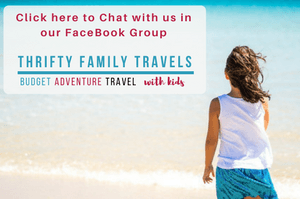 Click on the image below and pin to Pinterest.